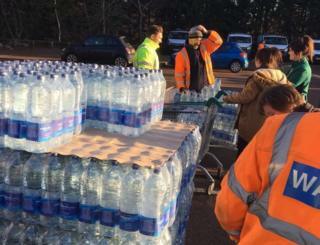 Some 10,000 homes and businesses have been left without water due to a burst main. Thirteen schools have also been closed in Tewkesbury, north Gloucestershire, as engineers work to repair the burst. Severn Trent Water used a helicopter and drones to locate the problem. It apologised and confirmed "water is gradually returning to normal for customers in Tewkesbury" and added it "aims to have everyone restored tonight as quickly as possible". Tens of thousands of litres of bottled water are currently being distributed across three water handout sites. The firm said it was using tankers to inject water directly into pipes to help customers. A spokesperson said: "As it's a wide area that's been affected, it's a complicated job to get the system back to normal and it will take a while for the pipes to refill, so please bear with us. "There may be some intermittent supplies or poor pressure overnight while we get everything sorted." Many local supermarkets quickly sold out of bottled water as news of the outage spread. It is the second major leak to hit the utility in recent months. In October more than 7,000 households had no water in Churchdown, Cheltenham, after a 24in (60cm) main ruptured.